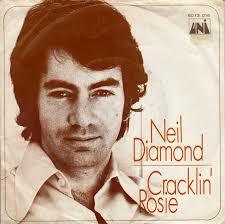 Cracklin’ Rosie lyrics and music were written and recorded by Neil Diamond in 1970. Married to a catchy and dynamic melody and arrangement, at first glance, once could be forgiven for believing that the lyrics suggest some a devotion to a lady of the night. However . . . . .
“Cracklin’ Rosie” is a song written and recorded by Neil Diamond in 1970, with instrumental backing by L.A. sessions musicians from the Wrecking Crew, from his album Tap Root Manuscript. In October 1970, the song became Neil Diamond’s first American Number 1 hit on The Billboard Hot 100, and his third to sell a million copies. It was his breakthrough single on the UK Singles Chart, reaching Number 3 for four weeks in November and December. Billboard ranked the record as the No. 17 song of 1970. It also reached Number 2 on both the Australian Singles Chart and the Irish Singles Chart. Its best performance was in New Zealand where it stayed at number one for 5 weeks at the end of the year. However, the reality is, that Cracklin’ Rosie is a type of wine. Neil Diamond heard a story about a native Canadian tribe while doing an interview in Toronto, Canada – the tribe had more men than women, so the lonely men of the tribe would sit around the fire and drink their wine together – which inspired him to write the song. The title has also been interpreted to be a misspelling of a rosé wine which is “crackling” – a U.S. term equivalent to pétillant or lightly sparkling. A Crackling Rosé is produced by, for example, Paul Masson Vineyards and Beckett’s Flat. Many Neil Diamond fans have traditionally believed the crackling wine he was referring to was Sparkling Mateus Rose, a medium quality, low priced artificially carbonated wine favored by college students on the West Coast of the U.S. during the late 1960s and early 1970s, or Richards Wild Irish Rose, an alcoholic beverage produced by Centerra Wine Company, which is part of the Constellation Brands organization. Jackson, Laura (2005). Neil Diamond: His Life, His Music, His Passion. ECW Press. ISBN 1-55022-707-6. pp. 70-71.